The Lillevilla Kastelholm is a traditional log cabin which offers a charming setting for an outdoor lifestyle. The Kastelholm has numerous potential uses such as a garden office, recreation room, playroom, snug, summerhouse and much more. Crafted in Finland using slow grown Arctic spruce, the Lillevilla Kastelholm is a quiet and cosy log cabin you can use all year round. The Kastelholm log cabin offers different window and door configurations dependant on the model you choose. The K0SD and K1SD has a single Georgian window and single Georgian door. The K0DD and K1DD models have double longline doors only. The K2DD and K3DD models have double longline doors with a single longline window to the front. The K4DD and K5DD have double Georgian doors only. 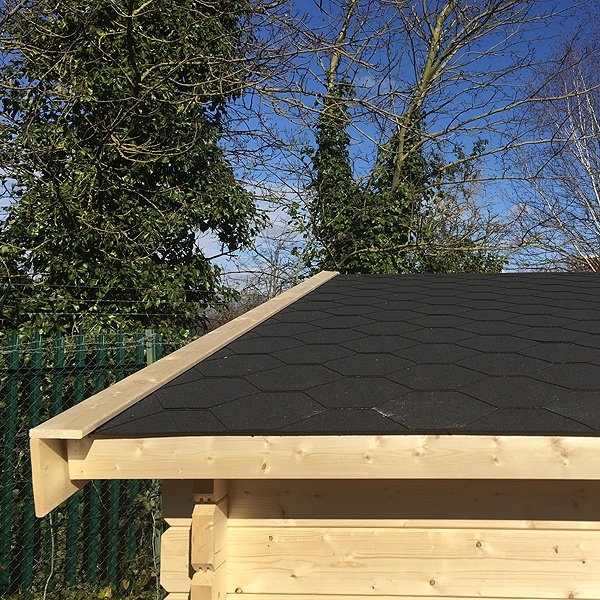 Like our Raseborg log cabin, the Kastelholm has a mineral felt roof as standard, which can be upgraded to charcoal bitumen felt roof shingles - this gives a longer lasting and better protected log cabin. Double glazing is standard throughout the Lillevilla range and you can also add floor and roof insulation to maximise heat retention in your building. This makes the building functionable all year round, whether it would be for entertaining guests or used as a home office. 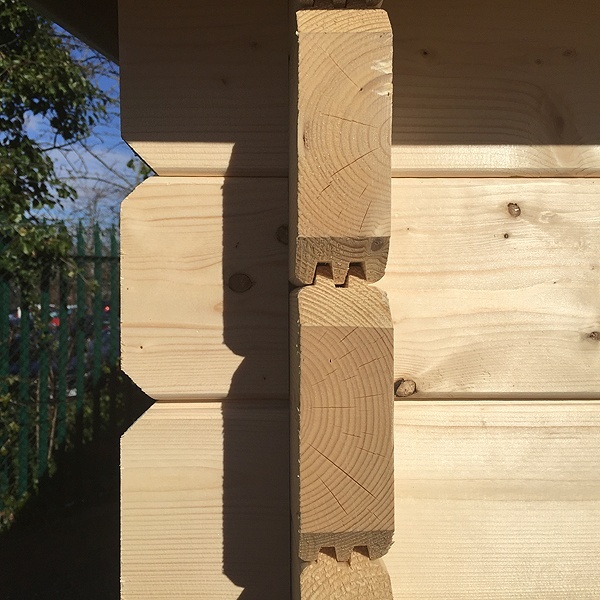 With over 36% more volume compared to other log cabins on the market, the 44mm double tongue and groove logs are thicker, stronger and won't twist or warp and create unslightly gaps in the walls of your cabin. As standard, the Lillevilla range includes double glazed windows and doors. All doors and windows are also provided with rubber seals to prevent drafts and heat loss. All buildings are supplied with a heavy duty felt as standard. The Kastelholm includes strong and durable 21mm tongue and groove floorboards sitting on 3in x 2in pressure treated floor bearers with a damp proof membrane to prevent rising moisture. Excellent attention to detail and extra peace of mind in very exposed areas. Our storm rods are uniquely fitted inside the logs - far superior to visible storm rods. Keep your possessions safe and secure with lockable doors. The Lillevilla Kastelholm is designed with a ridge height of under 2.5m so that planning permission is only needed in special circumstances. Delivery and VAT are included in the prices with a Hi-Ab crane delivery making this an easy delivery with no issues for customers. Every Lillevilla log cabin carries a 5 year manufacturing guarantee. They are built to last and will give you many, many years of enjoyment. Installation by professionally trained and experienced fitters. For that quality finish, add the bitumen felt shingles to your building which are supplied in an attractive charcoal colour. The comprehensive roof insulation comes with a vapour barrier sitting directly on the tongue and groove roof boards, followed by battons then a 50mm layer of Celotex insulation covered by a layer of OSB board which your roofing material is secured to. The floor insulation is a 50mm celotex insulation sitting directly beneath the 21mm floorboards. On the larger models, a partition wall and door is available to create an internal storage area within your building. Add an attractive log terrace for that perfect place to sit enjoying the afternoon sun. Add additional doors and windows to truly make the building your own. Please note - extra doors and windows will have to be cut into the cabin. This will be done free of charge when installation is chosen as an option. The Lillevilla Log Cabins are delivered untreated and will need to be treated within 2 weeks of being installed. We recommend our range of Protek Royal Exterior paint available in upto 60 various colours! Click here to view this range. Also available is our range of Restol Wood Oil which is UV resistant, water repellent and available in a wide range of contemporary and traditional finishes. Click here to view this range. The Lillevilla range is renowned for quality and longevity due to the durable, dense grained and slow grown timber. A highly advanced automated process guarantees unbeatable quality at great prices. Quality, affordability and service are at the forefront of all our Lillevilla range of products. Luoman companies are certified according to the ISO 9001 standards. Certification covers all areas of company activity. This creates a strong foundation for quality and development. Certification is awarded by DNV Certification Oy/Ab, an independent international classification institution. Luoman group has committed to pay regard to environmental aspects in it’s output and decision making and to improve continually environmental knowing. Certification is awarded by DNV Certification Oy/Ab. Luoman group have right to use PEFC-logo. PEFC is the world’s largest forest certification scheme. PEFC logo on the products tells the customers and the general public from sustainable forest management. Finnish Forest Certification Council has granted the certificate. PEFC logo licence is based on the chain of - custody certificate granted by DNV Certification Oy/Ab. The Lillevilla products of Luoman Puutuote Oy have been given the EU certificate of compliance on June the 30th 2008. This certificate gives the right to use the CE sign on the products. The CE sign means that the product fulfils the essential safety requirements of the directive. The regulations concerning the CE marking of building material and the requirements concerning the information given with the sign are specified in the law on building material certification and the statute issued on basis of the law by the Ministry of Environment. The abbreviation CE is for the French name les Communautés Européennes. The number of EU compliance certificate of Luoman Puutuote is 0809-CPD-0611. The products have received the EU technical approval ETA-08/0011. The Kastelholm K0 pictured at one of our branches. We display the Kastelholm at a number of our 35 branches : there's a list at the bottom of this page which indicates where you can go and examine the quality of construction of this fabulous cabin. If the Kastleholm isn't listed there may be other cabins on your nearest site which will give you a good indication of the build quality. Try our 'click to chat' facility to find out more. 'See before you buy' is always good advice, especially for buildings you may have found on the internet where you can't get a feel for the quality of construction. The Kastelholm K0 single door version pictured at one of our branches. Assembly service is optional using the manufacturer's own trained fitting teams or you can follow the detailed instructions yourself. You must have a totally level base prepared for the cabin before you can proceed with the installation. As you will appreciate, if the base is not of sufficient size or is uneven or out of level then the building may be impossible to assemble properly. 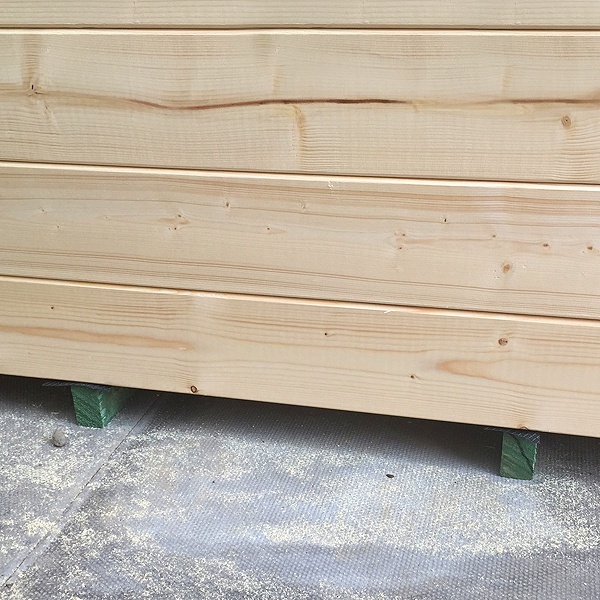 This is the 3m wide x 2.5m deep Kastelholm, ( 9'10" x 8'3" ) constructed in 44mm logs which fit together smoothly to create snug corner joints. It's been painted on completion which is important to help preserve the timber, apart from making it look stunning ! You can buy the paints through us or choose a contractor to do the job for you through our 'advertiser'. The Kastelholm double door model has full length glazed doors for an improved view and allows for access for larger items of furniture ! The Kastelholm has a single Georgian door and large Georgian style window to the front. With a classic log cabin feel, the Kastelholm also has optional felt roof shingles, optional floor and roof insulation, and can be installed by our teams of skilled fitters. There are six sizes available, pictured here is the 3.5m wide x 3.0m deep K2 version. The Kastelholm K3 cabin pictured is 3.5m wide x 3.5m deep. The 44mm interlocking logs make this a sturdy, high quality version of this typical log cabin design : what also makes this stand out from the crowd are the large, double glazed, Georgian style windows and doors which allow plenty of light into the building. Detail of the corner interlocks is shown here. The double tongue and groove construction is immensely strong and the 44mm thick logs provide protection against twisting and warping. The buildings are manufactured for us in Finland where highly advanced automation guarantees unbeatable quality at highly competitive prices. Kastelholm and Raseborg cabins are provided with a good quality mineralised roofing felt but for a little extra you can add these hard wearing and attractive felt shingles. You can just see the pressure treated bearers beneath the floor of this cabin, which provide for free circulation of air beneath the building. There's a dpc laid on top of them to help protect the cabin floor. The floor is constructed in proper tongued and grooved timber so if you looking at other suppliers please check that a) they include a floor in the first place and b) that it is not constructed of composite board ! Ours, it goes without saying, are part and parcel of the quality you would expect from Lillevilla. As you would expect, each cabin is supplied with a secure lock and high quality door handles. Shown here on a double door Raseborg cabin. The door and window handles are chrome finish and fit comfortably into their respective keeps. GBC have 35 sites across the UK where you can view our high quality buildings prior to purchasing. The Lillevilla cabins are displayed at two thirds of these currently : please check the foot of the page which shows where we have installed them before setting off ! Each of these sites has a selection of up to 80 buildings from leading garden buildings manufacturers so you will be more than welcome to come and browse, and perhaps enjoy a meal or drinks in the garden centre restaurant. Please check our display site pages so you can be sure of what is on show before travelling. Although the concept of putting a cabin together is easy, many people don't have the time, skills, or patience to tackle it. We can take the worry out of that by arranging installation (at an additional cost) from the manufacturer's own fitting teams. The picture shows the final phase of construction of a Stenberga cabin. A nice detail that you'll find on all Lillevilla cabins is the metal door threshold strip which protects the timber at the entrance to the building which would otherwise become dirty and damaged. All of our cabins are double glazed with Kite marked tempered glass. You can add a partition area to any of our cabins, used here as a kitchen space with a locking door if you need some basic security inside. This partition is shown in the Stenberga but the principle is the same for any of our buildings and often involves screening off one end of the cabin entirely rather than the square corner section shown. Additional doors and windows are available with most of our cabins : this picture demonstrates the addition of two end windows on a Stenberga S3 unit but the same principle applies to any of our other cabins with appropriately matched windows depending on the model type. All of our Lillevilla Log Cabins include delivery with installation by a skilled team of fitters - an optional extra for English customers only. We ensure that your summerhouse arrives in perfect condition and where applicable assembled to the highest standard. Please be aware that you will need to provide a good, strong and level base constructed from either slabs or concrete. This will need to be completed prior to our delivery date, ensuring that it is set and strong enough for the building to sit on. We will always confirm these details with you when you order and we will provide you with base plans (if required) so that no detail is left out. These measures ensure that your summerhouse will be both delivered and installed (if selected) without any inconvenience. As with all of our garden buildings, we like to provide our customers with a suitable delivery time. We always give good notice of our arrival date, allowing you to be sure it is the right time for you. All our Lillevilla log cabins are delivered via Hi-Ab lorry, we always appreciate any helpful information regarding access to your pre-prepared base area and any details you may need to share with us about reaching you - so that the delivery process can run as smoothly as possible. Our delivery times can vary from season to season, but typically you should expect to receive your building around 4-6 weeks from point of order. All of our buildings are made to order, so during the busy spring to summer seasons this may increase to 6-10 weeks, dependent on the building that you have purchased. Please feel free to contact us on 0800 999 0123 to check our current delivery times. Where Can I See Lillevilla Log Cabins?